There’s only one thing that can get third-graders dancing and squealing their way through the school lunch line on an otherwise ordinary Wednesday. And it’s not free dessert. WASHINGTON — There’s only one thing that can get third-graders dancing and squealing their way through the school lunch line on an otherwise ordinary Wednesday. And it’s not free dessert. “This is amazing,” one student exclaimed. “I love this white stuff. I don’t know what it is, but I love it,” another professed. 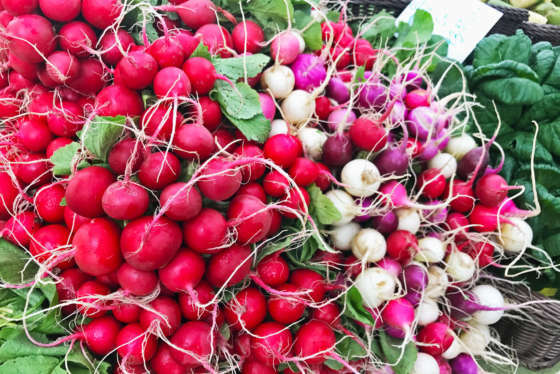 The warmer weather is making its return, and so are the area’s farmers markets. Here’s what you can expect to find in season this month. The “white stuff” was jicama, and along with kale, carrots, oranges and apples, it was one of the many options available on Westlawn Elementary School’s brand-new salad bar. 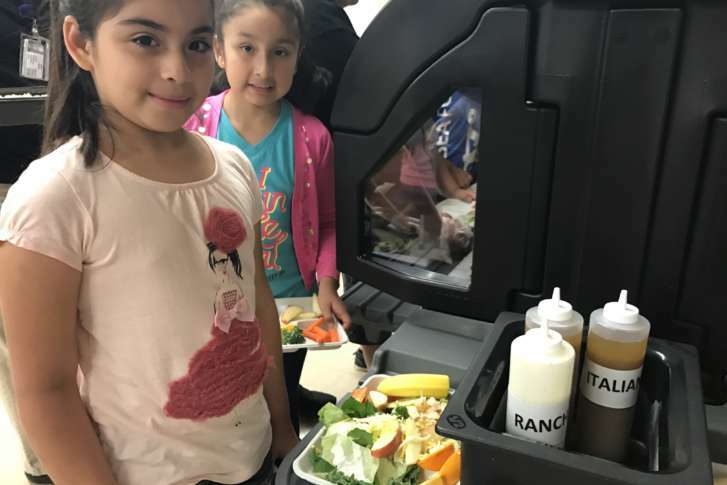 On May 3, the Falls Church, Virginia, school was the latest to integrate a fresh, self-service salad bar into its lunch offerings. Over the next five years, all 141 public elementary schools in Fairfax County will join them. “This idea that kids won’t eat salad, that kids won’t eat these fresh foods, is completely false. We’ve seen it play out again and again, week after week, with every salad bar opening,” said Mary Porter, director of programs for Real Food for Kids. The local parent-driven organization has been advocating for healthier school lunch options, including salad bars, since 2010, and recently partnered with Fairfax County Public Schools Food and Nutrition Services to help facilitate the change. “It’s so exciting to go into a school and talk to kids as they’re getting in the line for their first day and ask them how they feel about their salad bar — the smiles and the jumping and the excitement,” she added. Around the 1970s, the structure of the school lunch shifted. From-scratch cooking was out, and heated prepared foods became the norm. “So kids weren’t really getting anything that was a fresh strawberry or a piece of lettuce. They were getting things from cans and boxes or frozen,” Porter said. Because the available options were often unappealing to children, much of the food ended up in the trash and kids turned to vending machines to fill up for the day. Other school districts throughout the country, however, discovered the secret to combating the growing trend of unhealthy habits, food waste and low school lunch participation: a salad bar. Porter says a lot of the appeal has to do with the notion of self-service. Kids are making their own decisions — they just happen to be healthy ones. “I think what’s great with kids is that they love responsibility, so when they learn how to do this, it’s like, ‘I’m going to do this and I’m going to do this right,’” said Porter, who added that young students are also more likely to try an unfamiliar food if they see a peer pile that food onto their tray. Fairfax County elementary schools are still keeping their hot lines. The salad bar fulfills the fruit and vegetable requirement in the school lunch standards; a hot entree, a grain and milk are served in the traditional lunch line. Students who want to make the salad their full meal can do so by adding proteins, such as grilled chicken strips, beans and deviled eggs, which Porter says are a hands-down favorite among the children. Diane Nash is a parent of a third-grader and a fifth-grader in Fairfax County. The professional chef gives her children the option to buy lunch a few days a week. When they do, they often load up their trays at the salad bar. “My little guy, this has been the best for him because he asks for salad at home now and he never used to do that,” said Nash, who also volunteers and organizes programming with Real Food for Kids. Porter admits it’s not as easy as just asking for school salad bars and waiting for them to appear. There was, and still is, some resistance, especially when it comes to questions surrounding food safety and hygiene. Porter says hosting assembly-like trainings on salad bar etiquette and placing hand sanitizer at the start of the bar helps to alleviate these concerns. Then, there’s the issue of money. Running a salad bar comes at a cost for schools. In addition to purchasing fresh food and the required equipment, most schools hire an additional cafeteria employee to oversee its operation. However, this has not stopped other school systems from looking into the concept. Porter says Montgomery County is researching salad bar feasibility, and Alexandria City schools recently received a grant to install salad bars in their facilities. “It’s exciting to see that we can be a model, and I think one of the reasons we can be a model is because we are the 10th largest school district in the country,” Porter said. In addition to launching salad bars at the remaining Fairfax elementary schools, the county is also working to bring more locally grown produce into its cafeterias. “We want people to think fresh and local when they think about meals in Fairfax County Schools,” said Christie St. Pierre, the Fairfax County Public School farm-to-school coordinator.